In our previous post, we touched upon concepts of comparative advertisement, compare to various jurisdictions. In this post, we are delving deeper into some of the case laws, which read together provides some guidelines that can be used as a cheat-sheet for product/ price comparison or comparative advertising. The case of Hindustan Unilever Ltd. v. Reckitt Benckiser (India) Ltd. decided by the High Court of Calcutta forwards some interesting conclusions regarding ‘comparative advertising’ in India. The parties are two leading consumer goods manufacturers in India – Hindustan Unilever (“Unilever”) and Reckitt Benckiser (“Reckitt”) and the dispute has arisen over certain advertisements published by both parties through which each company alleges that the other has disparaged their products. The dispute which had arisen in this case related to four advertisements – two published by Unilever and two published by Reckitt. It was alleged that Reckitt’s promotional ads for their new product – Dettol Healthy Kitchen Gel, were aimed at disparaging Unilever’s product Vim. Unilever, in retaliation, had published advertisements of their products – Vim and Lifebuoy, which picked at Reckitt’s new product. The first advertisement published by Reckitt, referred hereinafter as Advertisement I, was a print media ad in which a white plate was put under a magnifying glass and it was claimed that one half of the plate was cleansed using Dettol Healthy Kitchen Gel and the other one using a ‘leading dishwash’. The half which was supposedly cleaned with the ‘leading dishwash’ showed substantially more germs as compared to the other half which had only one germ. The ad claims that the Dettol product “kills 100X more germs”. The second advertisement by Reckitt, referred hereinafter as Advertisement II, was in the form of a television ad which showed the same idea which had been portrayed in the print ad. However, this time the ad shows a Vim product being used along with the Dettol product. The claim of killing hundred times more germs is repeated. The third advertisement, referred hereinafter as Advertisement III, was of Unilever’s product Lifebuoy soap. The ad highlights the germ killing capacity of Lifebuoy as compared with Dettol antiseptic liquid, another of Reckitt’s products. The ad also includes the following statement – “It’s proven! Lifebuoy gives better germ protection then Dettol antiseptic liquid while bathing”. Curiously, the part which reads ‘while bathing’ has been written in a much smaller font as compared to the rest of the claim. The fourth advertisement, referred hereinafter as Advertisement IV, was of Vim dishwash in which Unilever has compared it’s product with another product – brownish in colour having a blue cap and a white label. This second product is an antiseptic and it is said that such products are bad for children and so children should not be allowed to wash utensils with them. Vim is shown as containing a natural ingredient – lemon, which makes it suitable for all. Reckitt had just launched its new product – Dettol dishwash gel, which was in line with their major product, the Dettol antiseptic liquid. Reckitt’s case is that the focus of their advertisement campaign was on “germ killing”, which is a unique character of their products and that these products are registered as drugs under the Drugs and Cosmetics Act, 1940. Their new product, the dishwash gel, had a cleaning agent to the drug which makes it both a cleaning agent as well as a germ killer. This gives their product enhanced efficacy as compared to Unilever’s products which do not contain any drug. The thrust of Reckitt’s campaign is this aspect of their new product, which makes it more efficacious than Unilever’s Vim, which is merely a cleaning agent with germ cleaning capacity. Reckitt argued that since Dettol was 10 times more efficacious than soaps without actives, they can have advertisements of this nature as they have a right to tell the truth to the customers. In support of this argument, they relied on section 29(8) and section 30(1) of the Trade Marks Act, 1999. They contend that section 30 is in the nature of an exception to the concept of infringement and that the one can use the mark of another for the purpose of identifying the goods with a proprietor, but such use had to be honest and no unfair advantage or detriment to the repute of the trade mark was to be caused. They claim such an interpretation permits comparative advertisements and that the impugned advertisements fall within the scope of such an exception. To justify their claims Reckitt has relied on scientific data which verifies that under particular conditions Dettol Healthy Kitchen Gel could achieve much greater reduction of germs than Vim could achieve. Reckitt has also argued that the right to make “commercial speech” is guaranteed under Article 19 of the Constitution and these advertisements were a type of commercial speech. Unilever contended that the reference in Advertisement I to ‘leading dishwash’ was necessarily and innuendo referring to Vim, as they had 2/3rd share of the market by terms of volume sale and turnover, making any reasonable person understand it as a reference to Vim. In Advertisement II, there is a direct reference to their product Vim. They also questioned the results of scientific tests submitted by Reckitt, contending that the conditions, in which those tests were carried out – a suspension test carried out by a virtually undiluted liquid for a period of 5 minutes, would not hold good as the conditions in which the product would be used in practice does not correspond to those conditions. They filed another test report which claims that in the practical conditions, while the Dettol product achieves 99.99% reduction in germs, Vim achieves 99.95%. Reckitt’s primary contention regarding Advertisement III is that comparison should be like to like. Dettol Antiseptic Liquid was recommended as a supplement to soap for bathing and was not a soap which ought to be compared with Lifebuoy soap. Thus, by publishing misleading advertisements they argue that there has been an infringement of their trade mark Dettol as it is contrary to honest practice and is detrimental to its distinctive character. They also highlighted the fact that the words “while bathing” were printed in very small font in an attempt to mislead the readers. Regarding Advertisement IV, Reckitt argue that the antiseptic in the ad is a reference to Dettol because it has 85% market share and that the colour can be easily identified with Dettol. They contend that identification with Dettol is easier by the use of the bottle the shape of which is similar to the Dettol Antiseptic Liquid bottle containing the amber colour liquid. Again, a non-antiseptic is compared to an antiseptic product, which according to them is not correct. Further, they point out that even Vim has a warning that it should be kept away from children. Unilever contended that the bottle does not resemble Dettol bottle and that the plaintiff cannot claim monopoly over the colour amber/brown of the liquid. They contend that truth is an absolute defence in disparagement and there truth in the content of the advertisement i.e. that Dettol is an antiseptic and should be kept away children. They also tried to rely on the de minimus principle, i.e. to say that the use of the bottle, being for less than a second, had a minimal effect. The court in their observations paid attention to the following legal principles in order to resolve the dispute between the parties. Nature of advertisements: Relying on various English and Indian judgements relating to the law of disparagement, the Court observed that generallyadvertisements are taken as a hyperbole by reasonable people. Ordinary man takes advertisements with a ‘large pinch of salt’. They observed that saying that one’s goods are the best in the world is only a more dramatic way of saying that his goods are better than those of his rivals. Such statements being made by traders ought to be allowed, as advertisements are generally of a ‘puffing’ nature. However, if that trader were to go further ahead and make statements which were positively injurious to his competitor’s product, that would amount to disparagement. Thus, it is the degree of defamation which mattered in deciding if a claim of one person was disparaging the product of another. Regarding comparisons being made, the court held that general comparisons being made may be allowed. If it were not to be so, the courts of law would be turned into a mechanism for advertising rival productions by obtaining a judicial determination of which product was better. Thus, the court held that comparing the qualities of one’s product with those of another is permitted, only if it is in the nature of a ‘puff’. This is so because while making a serious comparison of the qualities of a rival product, one may directly or indirectly denigrate another product. This is so, because, one must presume a constant bias in the mind of a trader, and hence claims about a rival’s product are bound to be false, misleading, unfair or deceptive. At the same time, there is a greater chance that a person may take such an advertisement more seriously due to a reference to specific claims such as scientific reports. The court observed that the principle of law, therefore, stands firmly established that disparaging advertisement, whereby the product of the competitor is denigrated is not permissible. Truth as a defense: The court observed that defense of truth or justification in the law of defamation, is not available in actions alleging disparagement of goods and services and arising out of a comparative commercial advertisements. Citing this reason, the court held that the scientific reports relied on by the parties would be wholly immaterial. Further, the courts would not be inclined in verifying the truth of each claim and comparisons of the products as it is not a machinery to adjudge which product is better. The court held that the sole test that would be relevant is that of the reasonable man, i.e. from the nature of the advertisement is there a chance of the reasonable man being misled. Right to commercial speech: Relying on the Supreme Courts observations in Tata Press Ltd. v. Mahanagar Telephone Nigam Ltd. the court held that the right to freedom of speech and expression under Article 19(1) encompasses the right to make and receive commercial speech. However, as with any other right, it is subject to Article 19(2) of the Constitution. Court observed that commercial speech which is deceptive, unfair, misleading and untruthful would be hit by Article 19(2). While the right to commercial speech gives a right to a trader to advertise his product, there is nothing in the existing law to permit a serious comparison by a trader of his product with the product of another. When this happens the commercial speech becomes unfair. 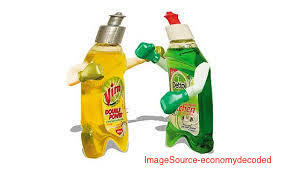 Regarding Advertisement I & II: The court agreed with the claim of Unilever that the reference to ‘leading dishwash’ would lead any reasonable man to construe it as a reference to Vim. They held that the law relating to innuendo in defamation applies to cases of disparagement of goods as well. Further, they held that the claim of killing ‘100X more germs’ than ‘leading dishwash’ and Vim (as directly referred to in Advertisement II) was in the nature of a serious comparative advertisement. They held that while proclaiming that Dettol Healthy Kitchen Gel ‘kills 100X more germs’ is permitted within the rule enunciated by White v. Mellin, at the same time showing the application of Vim whereby no germs are killed or removed, certainly denigrates Vim. The court said that the failure to show the germ removal capacity of Vim, without killing them, as declared by Unilever makes the advertisement one-sided and hence unfair and devoid of honest intention. Regarding Advertisement III & IV: The court held that the Advertisement III did not show the product of Reckitt in a proper perspective as Dettol antiseptic liquid is predominantly for germ eradication, as compared to Lifebuoy, which is for cleansing. The Dettol product has been marketed by Reckitt as a supplement to a cleaning agent and it is unfair to compare it then with such a cleaning agent. Further, they held that showing Reckitt’s product in an inappropriate dilution and context and then declaring that it has no germ protection capacity when compared to Lifebuoy was indeed disparaging Reckitt’s product. Regarding Adverstisement IV, the court upheld Reckitt’s contention that the antiseptic product being shown in the ad would be, according to a reasonable man, an innuendo to Dettol products. They observed that by saying that Dettol products being an antiseptic is dangerous would be detrimental to the product and hence amounts to disparagement. The court held that all the advertisements were hit by section 30 of the Trade Mark Act, 1999 as they were serious comparative advertisements which caused disparagement of the other’s products. All the impugned advertisements were injuncted by the court. With comparative advertising becoming more common, this case has laid down certain basic principles regarding comparative advertisement which may have the effect of greatly restricting the scope of this form of advertising. While the court has held that advertisements are not to be seen as true representations of the products and is indeed a hyperbole, they have signaled a strict no-no to attempts at picking on the products of one’s competitors through positively injurious remarks or by making serious (the meaning has to be understood as giving the reasonable viewer a more serious impression) comparisons with such products. While this judgement lays down certain basic principles, there is much that requires more clarity such as questions as to what would be a reasonable amount of puff or when would puff turn into serious comparison. Maybe someday, the Apex Court will get an opportunity to make the law more clear. Author: Gautam Aredath is a 4th year law graduate at NLIU, Bhopal. He is currently interning with NovoJuris. Disclaimer: This is not a legal opinion. Along with Reckitt Benckiser (India) Ltd. v. Hindustan Unilever Ltd., in which the companies were litigating against one another over a series of similar facts and circumstances. Judgement delivered on September 23, 2013. S. 29(8) – A registered trade mark is infringed by any advertising of that trade mark if such advertising – (a) takes unfair advantage of and is contrary to honest practices in industrial or commercial matters; or (b) is detrimental to its distinctive character; or (c) is against the reputation of the trade mark. S. 30(1) – Nothing in section 29 shall be construed as preventing the use of a registered trade mark by any person for the purposes of identifying goods or services as those of the proprietor provided the use – (a) is in accordance with honest practices in industrial or commercial matters; and (b) is not such as to take unfair advantage of or be detrimental to the distinctive character or repute of the trade mark. Timothy White v. Gustav Mellin, 1895 AC 155 and De Beers Abrasive Products Ltd. v. International General Electric Co.,  2 AllER 599 were heavily relied upon in understanding the nature of advertisements and the scope of comparisons between products. This entry was posted in Articles and tagged Advertising, comparative advertising, dettol, Dettol antiseptic, Dettol antiseptic liquid, Hindustan Unilever, reckitt, Reckitt Benckiser, unilever, vim on June 13, 2014 by novojuris.